Hi Dr. Blake. I know you must be very busy but i was wondering if you could help me. I'm a 32 year old female. I have been seeing a podiatrist for about 4 1/2 years, Initially with big toe pain which developed into chronic plantar fasciitis, eventually resolved in one foot by ESWT, the other foot being managed by orthotics only. I should mention that i am a radiographer and have access to xray/ MRI at ease (although not very good quality for feet as we don't have that particular piece of equipment) and referral to ESWT (not from my podiatrist), a colleague told me they had it and it helped- and it has. Dr Blake's comment: ESWT stands for Extracorporeal Shock Wave Therapy. It is the ultrasonic blast that is used to break down kidney stones. I am familiar, and have had patients whom have had it, but I no personal experience. Like PRP injections, I consider this on the fringes of treatment, but would definitely recommend prior to surgical treatment for plantar fasciitis. I also have a completely ruptured ATFL in my right foot, i believe caused by rolling my ankle once in the orthotics initially prescribed for me, and excruciating peroneus brevis tendonosis requiring a cortisone shot (different podiatrist now) (PB eventually got better now pain is only occasional- ankle instability to blame probably). Dr Blake's comment: So, a lot has been hurting, but you tend to respond well to treatment. Good sign!! The ankle ligament tear should be coupled with daily ankle strengthening--theraband for the peroneals, and single leg flatfoot balancing. On several visits i mentioned pain near the fibular sesamoid right foot but more towards the the distal phalanx in the meaty space between the big toe and second toe, it was getting worse and worse,(three podiatrists all said capsulitis) eventually i got a colleague to refer me for an x ray. it basically showed nothing except a small bony bit near the fibular sesamoid not really visible on previous x ray a few years prior. So i was concerned about it (no idea whether it was a fragment or osteophyte formation but convinced it must have something to do with my pain). 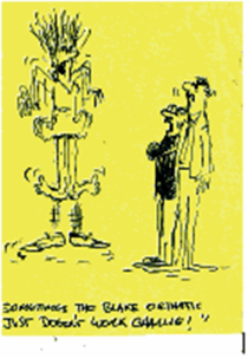 Dr Blake's comment: I am assuming it is the original big toe pain that started these pain symptoms. It was getting so annoying i pulled apart my orthotics and removed the tear drop shaped dome between the 1st and 2nd MTPJ for capsulitis. This gave some relief. I showed the podiatrist and at first he thought it was a sesamoid fracture until i showed him the MRI. 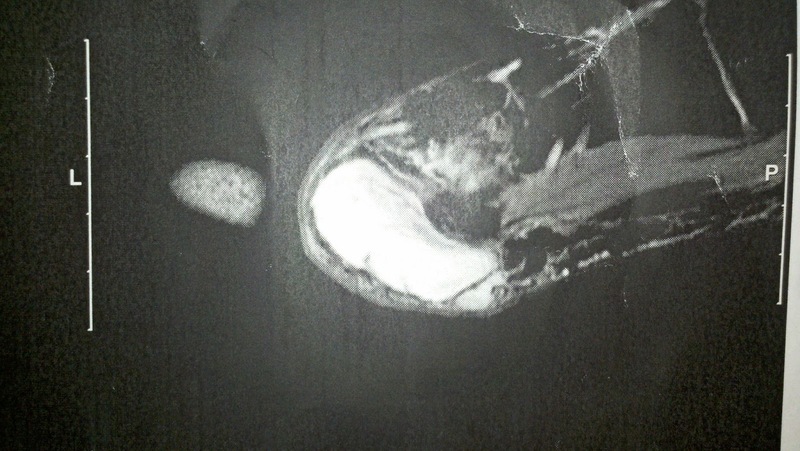 MRI showed ganglionic cyst extending from tendon sheath, first and second toe. Dr Blake's comment: This is why I love MRI so that all the bone and soft tissue is evaluated. Although not this patient, the MRI is able to clearly show the soft tissues of the sore area. The much bigger ganglion has a long stalk to the first toe. i then had a doctors referral to get aspirated and injected with steroid. The second toe was too small/tricky to aspirate (a little bubble sandwiched between two tendons). After two/three weeks pain started coming back- albeit not as bad as before. After two months i got another referral for aspiration and cortisone, however they couldn't see under ultrasound enough of the one under the first toe to do anything, and the second toe- could only inject around it and not in the ganglion or the tendon sheath. Dr Blake's comment: You have to hope that this means the cysts are calming down. At this point in time i am trying to increase my level of exercise- and have been enjoying doing so as it has been such a chronic limitation for me these past four years. I have weight to lose and i want to start a family (i'm 32) . I feel it is important for me to fix this once and for all. At this stage it isn't so bad but feel it when walking, after increased exercise it aches, i'm scared its just going to get worse again. Dr Blake's comment: Ganglions are common, and can re-occur post shots, but are actually not that common to remove. The shots can be repeated if bad. Surgery to remove can be a complete success, but can have complications more serious than the cyst. Now that you have identified the source of pain in this area, and you have at least a temporary fix, you can follow this closely. About 14 years ago when i was 18 (this might be relevant) i saw a podiatrist for pain in this area, i was prescribed orthotics under the impression it was some sort of tendon issue between first and second MTPJ- pain never really resolved- i was just putting up with it (no imaging done at this time). Dr Blake's comment: So much depends on how long you think this has been disabling to you since you have had the shots. Definitely you want to watch over the next 2 years, have some orthotic devices made that off weight the area, get a few more shots if warranted, and ice daily to keep the inflammation under control. You are not wrong if you just have it out due to the overall time, but if you desire, you still may be able to avoid surgery. I am wondering what i should do next. I was thinking orthopedic consult with view to removal because this has been such an ongoing saga for me that took forever to diagnose until i did the mri. The pain to me seems where the ganglion arises from the tendon sheath. The thing that worried me is that both my podiatrist and radiologist injecting the cortisone seemed to not think my pain came from the ganglions (well believe me i'm not making it up!). Can you shed some light on what is going on in my foot and what i should do? Is that bony fragment anything?? Dr Blake's comment: I will try to make time to read the MRI (Dr Rich Blake 900 Hyde Street San Francisco, Ca 94109), but if the first shot into the ganglion eliminated the pain for a while that is a great sign the sesamoid is not the issue. Also, now that you have had 2 injections, how is your return to activity going? Also i have a ganglion in my left foot too under the second proximal phalanx too (just because i felt similar pain there but much milder and got them to have a look. I thought i was going crazy for so long because none of the podiatrists believed there was something there. I was relieved when i found the ganglions to explain the pain. Dr Blake's comment: We doctors all function on some form of tunnel vision. What is never wrong is your body. Golden Rule of Foot: Listen to Your Body. You knew something was wrong, and it was. You have a body that heals and talks. It depends if what it says can be interpreted. Any advice and thoughts would be helpful because i cannot find much about ganglions under the MTPJ area anywhere except your blog (which is wonderful). I have xray and MRI images available if required. I am not sure what to do next. Is removal the answer? Dr Blake: Maybe your best choice, and I can hear the frustration loud and clear in your words.